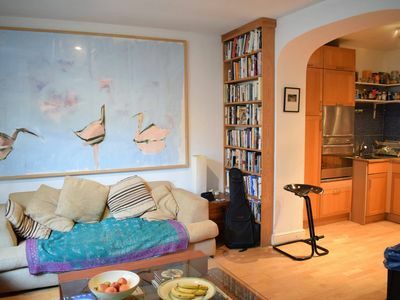 Homely and cosy, this 3-bedroom apartment which comfortably sleeps 7 people is just ideal for couples, families and groups looking for a base in London. With Westbourne Park and Queen's Park just a short walking distance away, getting around and exploring the wonders of London couldn't be easier! The apartment is spacious and fantastically light in addition to having its own leafy private courtyard. For a well-located, cosy, home-from-home, look no further! Once through the private gate, guests are greeted to a large, leafy, garden patio area at the front of the apartment. It couldn't be more ideal for a spot of fresh air or breakfasts and barbecues in the summer. Once inside, guests are greeted to a spacious and lovely living area which leads into the fully-equipped kitchen. The open-plan style means that the home has a real feel of a home-from-home. Thanks to the large windows throughout the apartment, natural light streams through, creating a warm and cosy atmosphere. The apartment boasts 3 bedrooms, one with a king-size bed and en suite bathroom and two double rooms sharing another bathroom. There is also the option of a single fold out bed in the living room should guests wish to use it. My cleaners place fresh, hotel quality linen on the bed just before your arrival. It's a mere 10 minute walk to Portobello market, and an 8 minute walk to Westbourne Park and Queen's Park tubes to visit the West End and explore London. Getting around and seeing all London has to offer couldn't be easier. After a fun-filled day, the apartment offers a bit of peace and quiet and it's the ideal place to relax with friends and family.